I am not usually happy to see summer go. Summer fruits and berries are leaving the markets. Just thinking about the end of peach makes me terribly sad! In Texas this time of year also means you have to keep an eye on the weather. One day it will be warm and sticky, the next it is cool and rainy, and that evening there can be dangerous thunderstorms. Good times! As the days start to get shorter, and the school buses return to tangle my morning commute, I have one delicious consolation. Pumpkin beer! I love the warm, spicy flavor of pumpkin beer for drinking, but I also enjoy experimenting with it in recipes. Usually I use pumpkin beer in savory recipes, like soups and in yeasty breads, but this time I wanted to add a hint of pumpkin beer goodness to a dessert. 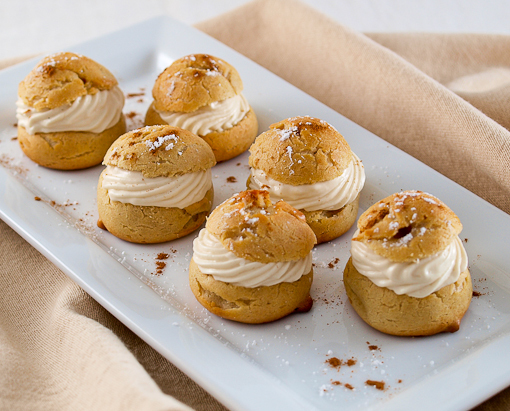 Pumpkin beer adds a subtle, earthy flavor to these puffs that is accented by a touch of cinnamon and a hint of sugar. Because the flavors in the puffs are not wild and robust I went with something a little more subdued for the filling. Of course, butterscotch is not usually associated with subdued but I had a plan. To tone it down I took a rich butterscotch base, basically an extra thick pudding, and whipped it with some slightly sweetened cream. 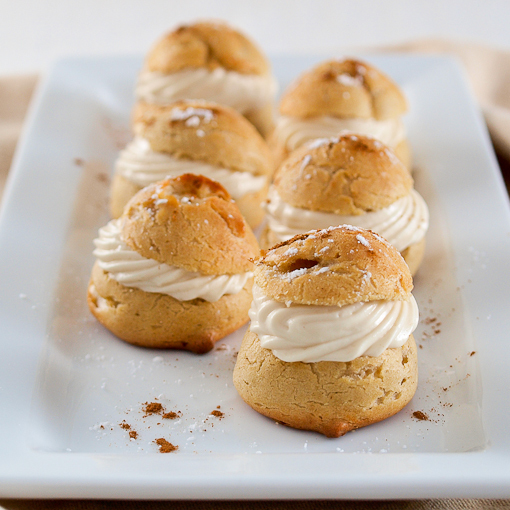 The result is a mousse that has a distinct, but not overpowering, butterscotch flavor that combines harmoniously with the pumpkin beer puff. 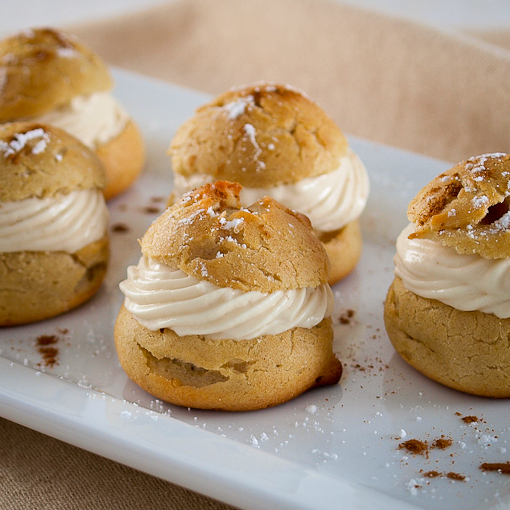 These little puffs are subtle, elegant, and perfect for a light dessert after a hearty fall themed dinner. 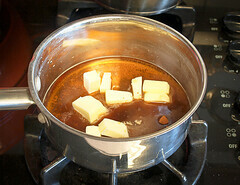 In a medium saucepan combine the butter and brown sugar. Cook until the mixture begins to boil and smells nutty, about 2 minutes. 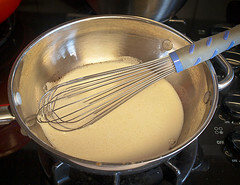 Transfer the brown sugar mixture to a blender and add the cornstarch, egg yolk, and milk. Blend until thoroughly mixed, about 45 seconds. Return the mixture to the saucepan and cook, whisking constantly, over medium heat until the mixture comes to a boil, about 5 minutes. Reduce the heat to medium-high and cook for 1 minute or until very thick. Remove the pan from the heat, place a layer of plastic wrap directly on the mixture and allow to chill until the mixture reaches room temperature, about 1 hour. One the base is chilled prepare the whipped cream. Combine the gelatin and water and allow to stand for 10 minutes. Melt the mixture in the microwave for 5 seconds, or until melted. Do not boil. Cool to room temperature, about 8 minutes. 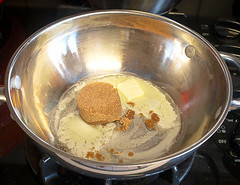 In the work bowl of a stand mixer combine the heavy whipping cream and brown sugar. Whip on medium speed until the cream thickens, about 1 minute, then add the melted gelatin and increase the speed to medium high. 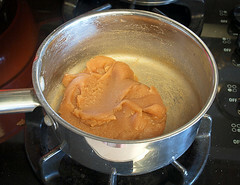 Beat until the mixture forms soft peaks, about 1 minute more. Add the chilled base to the bowl and whip on high speed for 30 seconds to combine. Cover the bowl with plastic wrap and chill while you make the puffs. Heat the oven to 375 F, and line a baking sheet with parchment paper. In a medium saucepan combine the beer, butter, sugar, vanilla, salt, and cinnamon. Bring this mixture to a boil over medium heat, about 2 minutes. Once boiling reduce the heat to medium-low and add the flour all at once. Stir the mixture vigorously until it forms a smooth ball and leaves a thin film on the bottom of the pot, about 2 to 3 minutes. 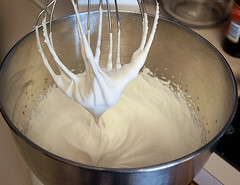 Transfer the hot flour mixture to the work bowl of a stand mixer. Allow the mixture to cool to 140 F, about 5 minutes. Once cooled beat the mixture with the paddle attachment and add the eggs one at a time, not adding the next until the first is completely combined. 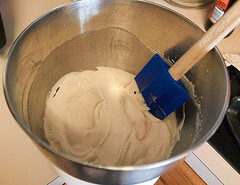 The mixture should be glossy and the consistency of very thick cake batter. Transfer the mixture to a piping bag with a wide tip (I used a 1A tub. Pipe the dough into 1-inch round balls no more than 1-inch apart on the pan. If the tops of the puffs have a peak just dampen your finger with water and press them down. 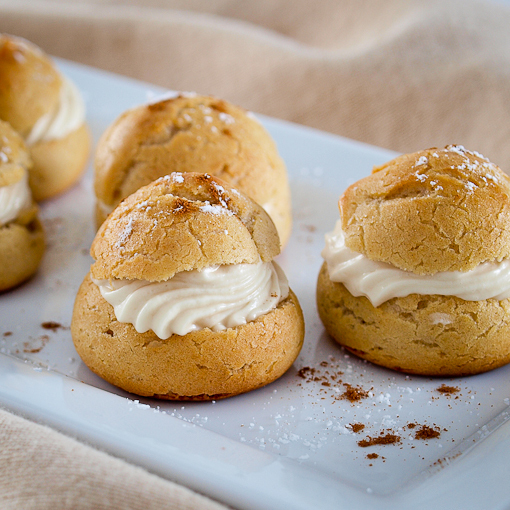 Bake for 15 to 20 minutes, or until the puffs are golden brown and feel dry to the touch. Cool to room temperature on the pan. To assemble, slice the tops of the puffs off with a very sharp paring knife. Spoon or pipe the mousses filling into the puffs, then replace the tops. Dust with powdered sugar and cinnamon, if desired. If you prefer not to use beer feel free to use equal amounts of apple cider or water.